Last weekend, the crew took another trip up to Rochester for a special occasion. 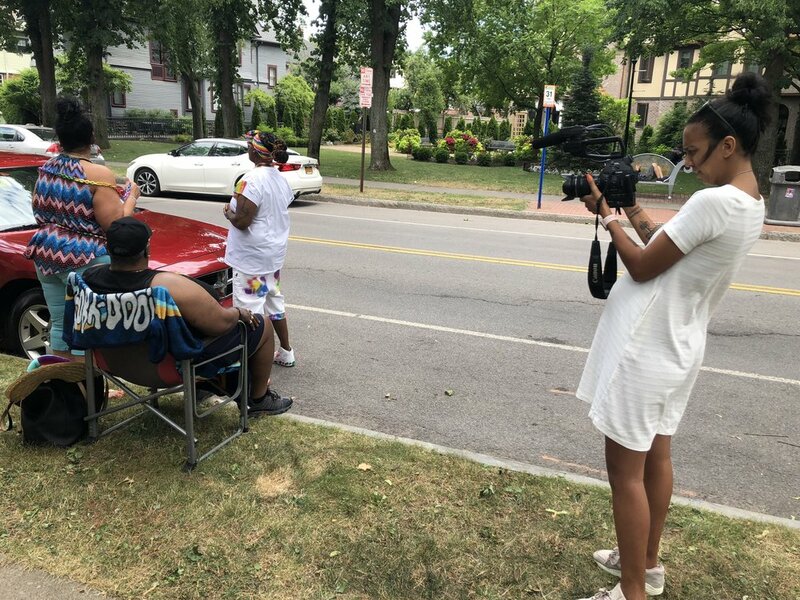 We filmed the Rochester Pride Parade, which took place on July 21 down Park Avenue. It was also Kim and Bell's two-year wedding anniversary and they celebrated in the streets with friends and family. (Left to right) Kim and Bell's friend Merle, Bell, Kim and their nephew Jesse. 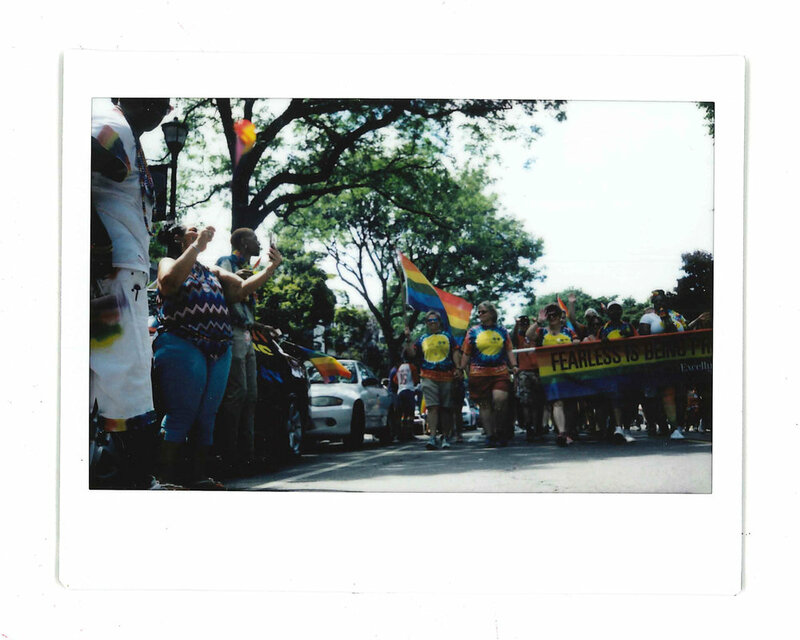 Kim (left) waving her Pride flag as the parade marches down Park Avenue. 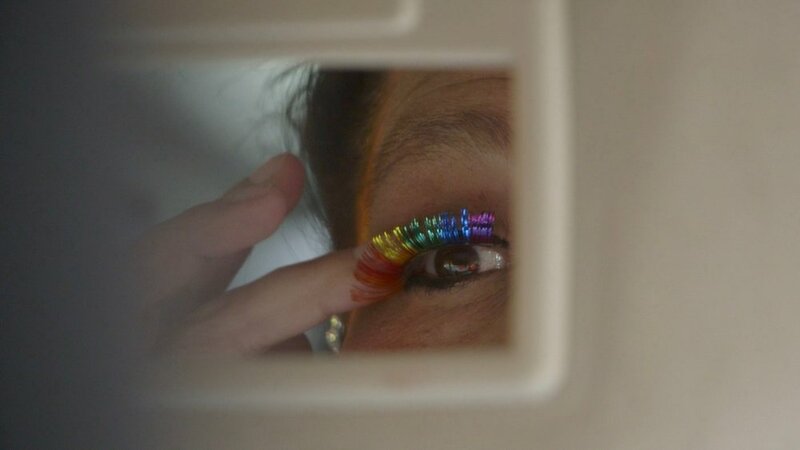 Bell bought Kim a pair of rainbow eyelashes and gave them to her before the parade. "She was born to wear those eyelashes," Bell said on her canvas chair, sipping on a homemade cocktail. Director Daniel A. Nelson filming a discussion between Kim (left), Merle and Bell. Writer/Producer Natalie Pattillo doing a bit of everything all while six months pregnant. After the parade wound down, we headed back to Kim and Bell's house to show them some old footage we'd dug up from a local TV station that covered Kim's trial. Bell always says that the first time she met Kim was on TV. After a somber viewing of the archival footage, we followed Kim and Bell to a friend's house to celebrate their two-year anniversary with friends and family. Kim celebrating her and Bell's two-year anniversary on a friend's patio. Kim's two half-sisters Wendy (left) and Lucinda were also in attendance. At the anniversary party, we finally met Kim's half-sister Wendy. Wendy was the only other person at the house the night Kim was forced to defend herself against Darnell. Wendy has never spoken to Kim, even today, about what happened in the early morning hours of Dec. 18, 1991. She says she never will. Her interview will be the only time Kim will ever hear what she has to say about that night. This was another key interview to help dissect what happened that night. At the time, Wendy was 15 years old and eight months pregnant. A couple days later, she was sat down at the police station and interrogated for six hours. She testified at Kim's trial the following year. The thing she remembers most is how "staged" it felt. Thank you for following Kim's story. Sometimes our updates are infrequent, but we are working hard to put this documentary together and share it with the world. Stay Tuned!